Everyone’s reaction when the first picture of David Harbour in full Hellboy makeup hit the internet was that he looked almost exactly like Ron Perlman’s iconic, extremely on-point version of the character. Harbour has no trouble looking the part, but what will really distinguish his take on Hellboy is his performance. In a recent interview with The Independent, Harbour described how he felt that his role as Stranger Things police chief Jim Hopper had definitely helped prepare him to play Hellboy. But Harbour was quick to add that he truly felt that the story he’s trying to tell about the hellish hero’s struggle with his inner demons is more akin to a Shakespearan drama. On a surface level, he’s an adopted kid from hell. He was meant to bring about the apocalypse. Yet, he just wants to be a good guy and fight evil. But he has this destiny. That struggle is very Hamlet-esque, even having tones of Coriolanus, where you have this guy who cannot understand his own true nature. Those levels of complexity, if we can bring that to this movie, which we’re trying to do, I think will be really rich. 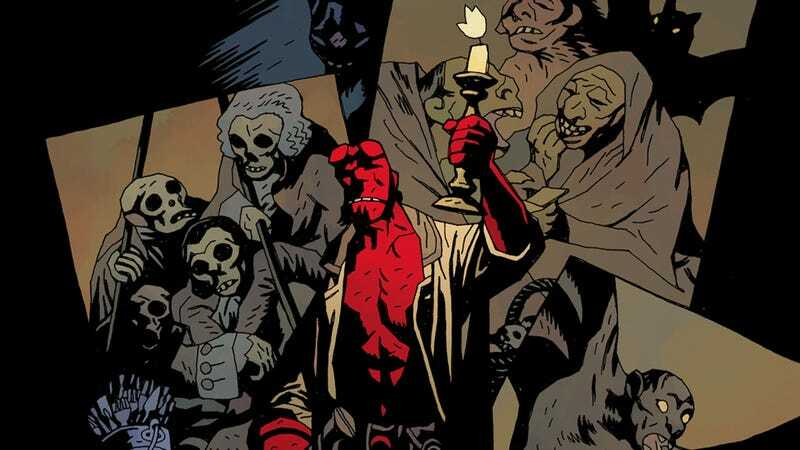 Hellboy’s need to reconcile his naturally fun-loving personality with the fact that he’s meant to be an arbiter of the apocalypse is a key part of what makes the character tick, and it’ll be interesting to see how Harbour decides to manifest that emotional turmoil. Let’s just hope that whatever makeup they’ve slathered all over his face doesn’t get in the way of his emoting.